Breastmilk has less protein than formula, which may explain why nursers tend to grow more slowly than their formula-fed counterparts. And for the formula-fed babies, that’s not a good thing. What researchers found worried them, as they said it could help predict obesity in children. The randomized study of 1,000 children followed them for 2 years, comparing those fed “regular” formula and low protein formula with breastfeeding babies. Kids who had used the low protein formula were approximately the same height as those fed the higher protein formula, but the latter group weighed more. Kids with low-protein formula weighed closer to what the breastfed babies weighed. These results…underline the importance of promoting and supporting breastfeeding because of the long-term benefits it brings. They also highlight the importance of the continual development and improvement in the composition of infant formula. Limiting the protein content of infant and follow-on formula can normalise early growth and might contribute greatly to reducing the long-term risk of childhood overweight and obesity. Other researchers disagree, pointing out that many formula manufacturers have already lowered the protein content since the study ended in 2004. (But not the levels of melamine or rocket fuel, apparently.) They’re also not sure about the long-term health effects of low protein formula versus “regular” formula. So should infant formula contain less protein? More research is needed, obviously, and some say that we should be following these groups into adulthood to get a better picture of the formula/obesity link if any. My child is 95th percentile in height, 90th in weight, and soon will take after me in the useless information category at 100th percentile. Any good pediatrician will tell you that those percentiles don’t matter; that it’s a way for docs to track whether your baby’s growth jumps or drops precipitously. The healthiest kids could be in the 10th percentile their whole lives. Just as my nephew, who has been consistently in the 100th percentile for weight (and was an extended breastfeeder, too) is simply freakishly tall like his Auntie Cate a head taller than anyone else his age, and therefore weighs more. Different kids grow differently, and this is just one snapshot of a child’s health. Perhaps the doctors in the United States can also look at the growth differences in these groups and reassess the growth charts. Or perhaps we can collectively give a big “Atta Girl!” to breastfeeders by extending maternity (and paternity) leave, encouraging women to bring babies to work in appropriate environments, and giving mothers as many “pumping breaks” as we do those who jones for a cigarette. Just saying. This is not suprising if you think about it. Cow’s milk is made by nature, to grow baby cows. Cows, through evolution, have evolved to be large and not that intelligent (compared to humans). Protien grows large mammals. Humans, by comparison, have evolved to be intelligent. 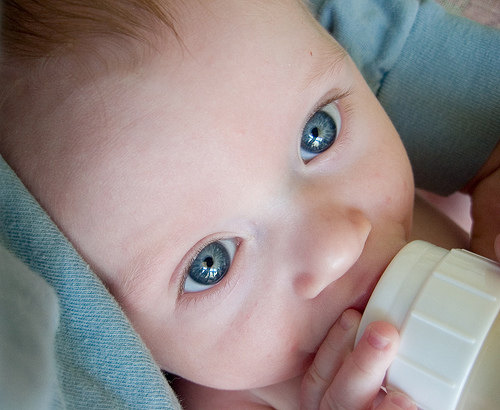 Human milk is formulated by nature to grow big brains–using fats–which human milk contains a lot of. Human milk also has less protien since we are not large mammals, like cows. So, let me get this straight. When formula was originally created, there was no analysis of breast milk and no attempt to copy breast milk? Even now there are discussions that don’t ask this question? Has their ever been any analysis of healthy and unhealthy breast milk? We know what our million dollar athletes need to eat and drink. But we don’t know what’s healthy for babies!!!! Bob: Manufacturers indeed did and do try to replicate breastmilk, but they just can’t seem to get it right. Certainly not better! Perhaps because they’re using milk from a species distantly related to us? Maybe (despite how it might gross out people to think about) they should go for gorilla or chimp milk. It’d make more logical sense, anyhow. And back up Veggie Momma’s point, to boot. The protein was made for bigger animals. Human milk is for human babies. On a side note, Natalie Angier writes in her book, “Woman: an Intimate Geography” about have formula manufacturers have tried, but failed to replicate all the human milk goodness. Remember a while back when PETA suggested that Ben & Jerry’s use human milk for their ice cream? Though I get the [annoying, poorly made] point, they should have pestered the formula manufacturers to use breastmilk. That’s a joke I would have appreciated. The world health organization has actually published growth charts that are designed for breastfed babies. The trouble with the growth charts fount in most doctors offices is that they have been both created and provided “free of charge” by formula companies! (I say “free of charge” as nothing is every truly free is it?! Formula advertising is effective and no good for babes and mom’s.) Of course the growth curve on these “free” charts follows that of a formula fed baby. This can be problematic for many parents as breastfed babies tend to follow a different curve ~ If your baby doesn’t match the “free” chart then maybe they need more than what your milk can provide?…should you feed them formula? This is the slippery slope that many mom’s find themselves on. If parents were given the breastfed baby growth charts to look at they may find that their babe fits that curve just fine! The breastfed baby growth charts that have been developed by the WHO are published with years and years of research behind them. You will find them on the World Health Organization’s website.